Marketer, big data, & privacy geek; author, blogger. Mary Ludloff is the VP of marketing for PatternBuilders, a Big Data Analytics solutions and services company. She is an innovative executive with more than 20 years of experience in the high tech industry. When it comes to marketing she has, in her own words, "been there, done that and often, with little or no budget." Our translation: Mary understands how to develop and implement strategic program initiatives that span marketing disciplines-ranging from the traditional corporate and marketing fields to the latest developments in digital marketing (yes, much more descriptive and far less interesting than her own words). Through her work at Brio Technology (now Hyperion) and NONSTOP Solutions (now Manhattan Associates), Mary also brings a deep understanding of supply chain management issues as well as the use of business intelligence tools in data warehousing and analytic application efforts. 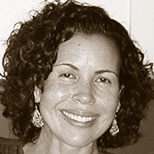 Mary is co-author of "Privacy and Big Data," a frequent white paper contributor, an editor of many reference manuals, user manuals, and other publications, and a blogger on diverse topics such as big data and analytics from a technology and business perspective, data security, data privacy, and marketing in the digital age. Webcast: Privacy and Big Data: Is there room for privacy in the age of big data? In this webcast, Terence Craig and Mary Ludloff, authors of Privacy and Big Data, ask and answer this question: What level of privacy do you really have in the age of big data? "The book offers worthwhile knowledge about Big Data and privacy issues and is well worth the time to read for anyone concerned about either topic, including DBAs, programmers, managers, and anyone who shares their information on the Web."